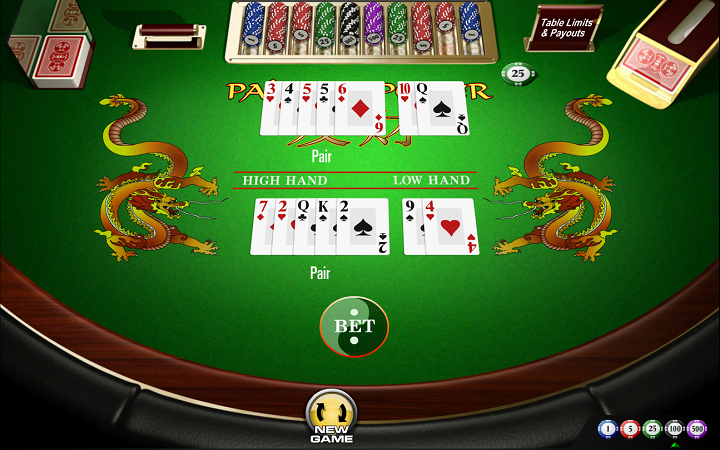 Pai Gow Poker by Amaya Gaming is a variation of Chinese domino game by the same name. It is invented in Las Vegas, during the 50’s. Pai Gow poker is a very social game because every player plays against the same dealer hand. In other words, the table wins and losses as a whole. The digital version does not have that social aspect of course, but it is still a fun game. The interface looks simple enough, and it is easy to learn the game in mere minutes. Graphics-wise, the game is not that impressive but this is a card game after all – the only graphic we have is a static image of a poker table. To start the Pai Gow poker, place your bets first. To do that, simply click on the poker chips which are located at the bottom right. As you can see, the bet levels are in between 1 and 500 coins. (You can bet maximum 100 coins in the free version.) After placing your bets, click on the “new game” button and start to play. You will get seven visible cards, just like the dealer. Although, the cards of the dealer are not visible yet. You need to discard two of your cards to continue. The goal here is to form two different poker hands: a five-card hand and a two-card hand. Both hands must have higher values than the dealer. Standard poker hand rankings are being used, so if you know how to play poker, you already know how to play pai gow poker too. After discarding two cards, you need to click on the “done” button. The cards you discarded will move on the “low hand” section and the rest will stay on the “high hand” section. This is also the end of the round: your poker hands will get compared to the dealer. The side with the higher rankings wins the round. As like the casino version, Pai Gow poker by Amaya Gaming also has a %5 commission on all winnings. The general strategies of classic poker work in this game too, so we highly recommend you to use them. Pai Gow poker is an interesting variation which we recommend to every type of poker player out there. Play at Casino Avenue to find more poker games online!